The Simple, All-or-Nothing Verdict Form - В сложной финансовой ситуации приходит на помощь кредит наличными в Казахстане. Attention should be given to the verdict form you want the jury to fill out after listening to and seeing the evidence presented in the case. This verdict form dictates how the jury decides the facts in your case in the context of the theme of your case and the jury instructions. Needless to say, the verdict form is very, very important! There are times when a party may want a simple, all-or-nothing verdict form. A party may like this (such as the plaintiff) versus a special interrogatory form that contains numerous potentially confusing questions the jury is asked to answer. For example, an all-or-nothing verdict form may simply ask the jury as the first question whether the defendant breached the contract. If the jury answers yes, then they need to answer the second question which would be the amount of damages that should be awarded to the plaintiff as a consequence of the defendant’s breach of the contract. On the other hand, if the jury answers no to the first question, they should not answer any more questions as the jury’s verdict is in favor of the defendant. Evan Finkel [Defendant] was negligent. Was such negligence the legal cause of loss, injury or damage to the Plaintiff, Yarielsi Batista? If you answered “NO” to Question 1, your verdict is for the Defendant, Evan Finkel and you should not proceed further except to date and sign this verdict form and return it to the courtroom. If you answered “YES” to Question 1, please answer Questions 2 and 3. The jury answered “No” to this first question finding for the defendant; no damages were awarded to the plaintiff. [T]he plaintiffs here did not object to the verdict form that invited the jury to return a verdict on an “all-or-nothing” basis. The jury answered the first question presented to it in the negative, finding that the accident was not the legal cause of loss, injury, or damage to Ms. Batista [plaintiff]. 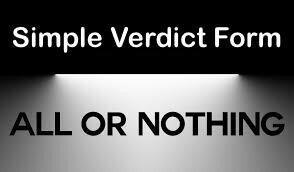 Consistent with verdict form’s instructions, the jury answered no further questions and awarded no damages. It is well-settled law that “the jury cannot be faulted for doing exactly what it was instructed to do” in these circumstances. For these reasons, we reverse the order granting a new trial. Finkel, supra (internal citation omitted).